The Harvester. Short story by Jennifer Bisignano. The Write Launch. Her name was Poly. This was after a condition polydactyl. She was born with an extra thumb on each hand. Poly’s doctors decided to remove the fingers to mainstream the child into society. Her father kept the thumbs in a jar. Sorcery was prevalent in his family, and he knew this was a good omen. As an infant Poly’s mother began to see signs that she was different. When she brought her home from the hospital and laid her in her crib, she would scream. The painted walls of pink and pastel would cause her to reach for her mother’s breast, until she was carried into a darkened hallway. She would close her eyes and catch her breath, before falling asleep. Poly’s room was eventually painted like a dark forest complete with trees that swayed under a frightened sky. Terrified forest animals along the windows hid along a broken cobblestone path. A lonely child stood in the middle, confused. Her crib was woven with the threads of silky spider webs. Sounds of thunderstorms and crashing waves lulled her to sleep. She was always a bit colder than the other children, so her mother made her a dark gray blanket of the softest alpaca. Poly carried this blanket everywhere and pressed it close against her cheek when she became worried. Her breath was a small puff of chilled air. She was a quiet child and thought about things that most children would not. When a bee stings a child, did the insect suffer when the stinger was ripped from its body? Did it feel remorse or burn in some kind of insect hell? Did red ants form colonies and become a super species for being stepped on all those years? These are the ideas that filled her thoughts. Poly asked why infinity was a continuous circle but death came so quickly. Why the rain was celebrated with puddles and umbrellas, but the storms carried fear? When Poly turned five, things started to change. She was in touch with the elements, and her red curls would straighten when she became frightened. She would befriend those who seemed not to fit in and be frightened of those that did. Poly’s father handed her a red stone looped around a leather cord. “This stone will protect you when you are young, but as you age your elements will grow old. They will wither and blow as the dandelions.” Poly smiled and lifted a speckled iguana close to her face. The iguana closed his eyes and softly kissed the girl with his swirling tongue. Her red hair began to curl. One afternoon, when the children were playing, they began to push Poly. They spit on her and called her a freak. Poly fell. She cried as they crushed spiders under their feet, and danced around her. 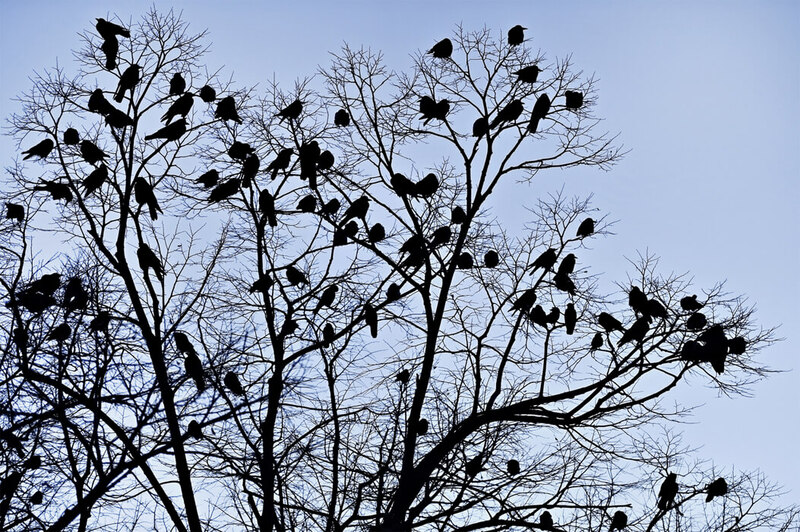 Three black ravens spiraled down from the trees and circled the children ripping their hair, clawing at their eyes. The teacher ran over, ignoring Poly and raised her arms at the birds. She ran the children into the building. Poly sat in the middle of the colored cobblestones and watched the birds swirl into the trees. They sat close enough together that the branches dipped. The fog from her breath became icy and her red hair straightened. She felt as though someone was watching her, although she saw no one. As she limped into the school, the crows cawed. Poly looked over her shoulder. From that day Poly sat alone. She grew older and waitressed at a Waffle House. She did this mainly to people watch. The job wasn’t difficult. The application consisted of three questions: What is your name, are you legal and mentally stable. She said yes to two. If you worked long enough at the Waffle house, they placed the date you started under your name. Poly’s tag said she had been there two years. One Sunday, a tall Asian woman walked in. She had short bobbed hair and her companion had three fingers. Poly watched from the waffle irons. The Asian woman poured bits of syrup on a teaspoon and placed it on the tip of her tongue. She handed the spoon to the three-fingered man who raised it to his nose and then placed it back in the cup. Poly walked over and the Asian woman stood. She towered above Polly and bowed. She turned Poly’s palm over and ran a finger over the scar of her detached thumb. When Polly returned with the woman’s order she was gone and a hundred dollars was in her place. Poly walked home alone that night. Her red curls covered her eyes as the wind blew through the falling leaves. She pushed against the beaten pathway as a stream of papers rustled under her legs. A man in a brown fedora chased behind them. He reached and stretched, jumping off the sidewalk as signatures rustled through the trees. The man stopped, as Poly turned to help him. He placed what he had collected in an oversized bag and stared at her. The papers raced past Poly but the man no longer had the desire to chase them. “You’re the girl,” he said reaching inside his hat. The man handed Poly an envelope. It smelled of ash and sulfur. On the front was a large letter “P” in red ink. “Open it,” he said. The paper was parchment with a simple line for a signature. The man handed Poly a pen. Poly held the piece of parchment between her fingers and her breath drew an icy fog. “Who are you?” she asked as the man placed the brown Fedora back on his head. “What do they do wait for?” Poly asked as her hair straightened. “For my instruction.” The Harvester tipped his hat. Poly felt the cold lift the hairs on the back of her neck. The crows lowered the branches on the trees around her. She lifted the parchment paper to her nose to smell the ash and sulfur. The Harvester’s eyes changed, as though he somehow stole the Northern Lights. “Why would you take the souls of those that searched for something more? Why would you place them in a vessel and then extinguish them like a spark? What do I have that you see, that makes you think I could help you?” Poly’s crimson red hair not only straightened but also grew. Her breath grew so cold that her lips chapped and drew blood. Poly gripped the red stone around her neck and tugged. The leather cord from years of being weathered snapped and lay in her hands. “Your father gave you that stone many years ago because he knew we would meet. The stone when you were younger kept me close enough to watch you but at a distance so I couldn’t feel your icy breath. In a year on this day, you will die whether you hand me a piece of parchment with your signature on it or walk away. Those around you will cry at your funeral and speak of what an amazing person you were. If you walk away, that will be your only legacy.” The Harvester’s white hair under his fedora began to blacken. Poly stared at the birds in the trees as they gripped the branches with their clawed feet. They cawed and closed their eyes. Poly turned to the Harvester, who smiled at her as he stroked her long red crimson hair. “Where do the souls go?” Poly asked hesitantly. The Harvester smiled and removed two fingers from his jacket pocket. He straightened his arm and circled the tips of his long bloodied knuckles three times. From the ground a light sparked that grew and widened, causing the asphalt to tumble inward. Poly covered his face with the back of her hand as the heat rose and the cries deafened. Poly listened to the faint cries beneath the light and watched the eyes of the Harvester blacken. As she turned her head the crows were gone and Poly stood under a single street lamp illuminated. She unfolded the piece of paper in her hand and brought it close to her lips. The imprint of blood stained the parchment and she held the hand of the Harvester, walking into the night. My name is Jennifer Bisignano and I have written two children's books My Abuela is Sick and I Do Not want this on my Plate. I have a Masters degree in Early Childhood and have been subbing in the school system. I have chosen a lot of Title 1 schools and found inspiration in my writing. Read more articles by Jennifer Bisignano. All original work attributed to Jennifer Bisignano © 2017 Jennifer Bisignano.